April 25, 2018 /0 Comments/in For Educators /by Darko S.
Why did the kid cross the playground? Nothing warms a parent’s heart like seeing or hearing their children laugh. Kids start to develop a sense of humor from an early age, but it’s not as sophisticated at that time as it will be when they grow up. Babies will react with laughter to funny noises or faces, and especially to physical touch (e.g. tickling or raspberries). The game of peekaboo is the funniest thing in the world to a one-year-old, but later on, they won’t find it funny at all. As we can see, at this age, a child’s sense of humor mostly consists of reacting to others doing something funny and trying to make them laugh. When children learn to speak, they start to make their own jokes and take a much more active role in humorous interactions with others. This is important because devising their own jokes helps them in the process of learning and mastering language. School-age children begin to use humor not only for its intrinsic value but also for a social purpose, such as joking to avoid embarrassment or to create solidarity among peers . By the time they reach the secondary level, they have a better grasp of what words mean and can get into wordplay and create some more complex forms of humor, such as sarcasm. Everyone wants to be seen as funny and witty, but what makes humor in children especially important? First of all, engaging in humor helps children see the joy of life and teaches them not to take themselves too seriously – that’s what adulthood is for (just kidding!). A good sense of humor helps with the development of spontaneity and the ability to put themselves in other people’s shoes. When exchanging jokes with peers, children practice thinking in a more unconventional manner, as well as being creative and quick. Humor is also a good way of connecting with one’s parents and peers. Researchers found that kids who are better at making and understanding jokes are more socially competent, more popular, have better prosocial skills, and are less likely to be depressed [3, 6]. In other words, a good sense of humor can help children feel more competent and in control of social interactions at school and with their peers. The use of humor is also linked to better physical health, and, some studies show that humor has a similar effect on reducing stress levels as physical exercise [6, 7]. In other words, humor is a great way to relieve oneself of tension. Instead of dwelling too long on a stressful situation, looking at the positive aspects and even laughing at the whole thing after resolving it can help build a positive attitude. Nevertheless, you should bear in mind that not all humor is benevolent. There are some types of humor that are less desirable, such as off-color humor, or jokes at the expense of others that should be discouraged. Psychologists describe four general humor styles school-children and adolescents use, and we’ll take a look at each one of them [3, 4, 5]. The first two types of humor listed are considered to be adaptive, as they build relationships or one’s own ability to cope. The second two are considered to be maladaptive, as they harm – either one’s own self or other people (peers, teachers, etc.). Affiliative humor is a well-meaning, benevolent style of humor which children use to amuse other people, to facilitate relationships, and reduce interpersonal tensions. They often engage in spontaneous witty interactions, tell jokes, or say funny things about themselves, and at the same time not take themselves too seriously. Self-Enhancing humor is used to maintain a positive and humorous outlook on life, to boost one’s mood or deal with stressful situations. It’s regarded as a healthy defense mechanism that helps one avoid negative emotions. As one girl puts it: “When someone was upset we would say, ‘turn that frown upside down.’ The other person would always be looking down so you would bend over and go upside-down and make a silly face and it would always just make whichever one of us feel much better” . Self-Defeating style of humor is an attempt to amuse others by doing or saying something at one’s own expense or laughing along with others when ridiculed as a means of gaining approval. Self-defeating humor is often related to low self-confidence and emotional neediness, and it’s used by “class clowns” in school, as well as children who are being bullied [1, 5]. Aggressive humor is used at the expense of others, often without regard for the potential negative impact on them and their feelings. It includes the use of humor to manipulate others by means of ridicule. The examples of this humor style are sarcasm, teasing, “put-downs”, etc. Bullies can use not only aggressive humor but affiliative as well. Bullies who use affiliative humor are often good at social skills and use this type of humor to harass children who are not part of their social group, or to emphasize their own importance in the group. Furthermore, by using aggressive humor, they demean their peers in front of others or exclude rejected children by spreading rumors in a way that does not exceed the social norms of their group . Parents should learn to differentiate between different types of humor, then set some boundaries, with themselves and their children, so as not to encourage inappropriate humor. When children make a rude, hurtful, or untimely joke, a parent can either not laugh, or even better, explain to them why the joke isn’t funny. Modeling how to respond to aggressive humor can help them respond appropriately to their peers when something hurtful or rude is put in a “just joking” form. Furthermore, children sometimes have trouble determining the appropriate place and time for a joke, so parents should try to provide them guidance in those moments. For example, using “potty” humor at a sleepover with friends is probably okay, but saying the same type of jokes in class at school is not okay and may be considered rude or disrespectful. – Make sure to create an environment with lots of humor and fun. If you have younger children, surround them with humorous books, or funny cartoons. If they’re a bit older, books or comics will work as well, but you can also watch comedy TV shows, stand-up comedy shows, and movies together. – Be their comedy role-model! It’s likely that they’ll develop a great sense of humor if they’re surrounded by their parents telling them funny stories and jokes all the time. Put a smile on their face every day! 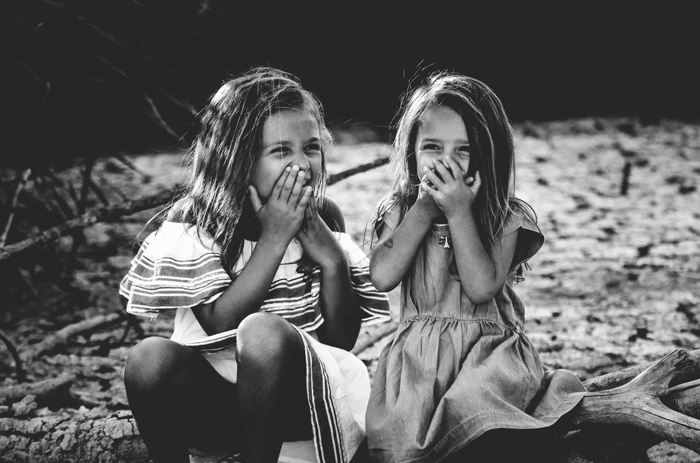 – Encourage your children’s attempts at humor and never miss an opportunity to tell them you loved their joke. If the joke isn’t funny, try complimenting their effort and provide them with advice how to make it even better. Then try out that joke on someone else together. After all, kids learn by doing! – Try playing The No-Laugh Challenge together. One should really try hard to make the other one laugh, and that person should make every effort not to laugh. It’s a hilarious game which is really hard to win! What did one plate say to the other plate? Why did the student eat his homework? How do you stop an astronaut’s baby from crying? Why are ghosts bad liars? We hope you enjoy adding some more humor into your home and your relationship with your kids. For other ways to boost healthy relationships with your children, check out this article. Cunningham, J. (2005). Children’s humor. Children’s play. SAGE publications. Dowling, J. S. (2014). School-age children talking about humor: Data from focus groups. Humor, 27(1), 121-139. James, L. A., & Fox, C. L. (2016). Children’s understanding of self-focused humor styles. Europe’s journal of psychology, 12(3), 420. Kuiper, N. A., & Leite, C. (2010). Personality impressions associated with four distinct humor styles. Scandinavian Journal of Psychology, 51(2), 115-122. Martin, R. A., Puhlik-Doris, P., Larsen, G., Gray, J., & Weir, K. (2003). Individual differences in uses of humor and their relation to psychological well-being: Development of the Humor Styles Questionnaire. Journal of research in personality, 37(1), 48-75. Semrud-Clikeman, M., & Glass, K. (2010). The relation of humor and child development: Social, adaptive, and emotional aspects. Journal of child neurology, 25(10), 1248-1260. Szabo, A. (2003). The acute effects of humor and exercise on mood and anxiety. Journal of Leisure Research, 35(2), 152-162. If you need any kind of advice related to the development of your child, you’ve come to the right place! How Do We Gain From Being Kind? Join our newsletter and get your first free eBook. How Do We Gain From Being Kind? Good Parenting without Overmonitoring – Yes, It’s Possible!